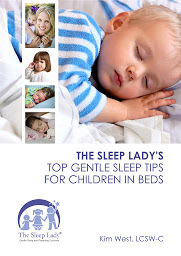 Would you like to have me answer your baby sleep or toddler sleep problem in my next video? If so, scroll down and submit your question in the comment section below. I will pick several questions a month to answer and post them here on the blog! Sarah, you’re doing a lot of great things. Bedtime is at a good time, 7- 7:30 p.m. for his age. He’s still taking two naps anywhere from one to two hours each so that he’s probably getting somewhere around three hours total and good for you! And you haven’t tried to transition him to one nap too early in hopes that it would help him sleep better at night. You have also already weaned him off the bottle during the day, you’re watching his nutrition and making sure that he’s eating well. I would check in with your pediatrician about whether he needs to receive calories during an 11-hour period at night given how much he tends to eat over a three to five day stretch since after a year old a toddler’s eating can be up and down. Again, check in with your pediatrician and get that green light so you can feel confident about weaning it. Once you get the green light, you can start to gradually wean the bottle by reducing the amount in both of the bottles until it’s down to two or three ounces and then you have to make the big decision to not offer the bottle when he wakes during the night. Wean the bottle in seven to 10 nights max. Read this article for more details on weaning the bottle. I would also do the same thing at bedtime so that you get to the point where he’s having just a water cup while you’re reading a story. If that makes you too anxious especially if he tends to not eat a good dinner for instance and you find yourself thinking “But he hasn’t eaten anything since 5:30pm. How will he make it to 7pm?” which I get, then have a small bottle of milk or a milk cup at bedtime. Make sure he does not get drowsy with the milk bottle or cup. You’re going to have a hard time having any progress in the middle of the night if he is zoning or getting too drowsy with the milk cup or bottle. If you aren’t already, get in to the habit of brushing his teeth after the milk cup or bottle at bedtime to avoid cavities. So, your big jobs are three fold. One is to wean the bottle during the night. You’re going to first talk to your pediatrician about his eating and if he needs to receive calories during the night. If he does not you can begin to work on weaning the bottle completely by slowly reducing the amount in the bottle within 7-10 days (its ok to go faster also). Make sure you are putting him down awake at bedtime without a bottle at bedtime to get him to a drowsy state. Respond to each waking in the same manner and don’t start the day until after 6am. Be consistent for long enough! If you successfully weaned your toddler off the bottle during the night, please share what worked for you.Please feel free to click the “reply” link under this article and leave them a comment. Supporting each other makes parenting so much easier! First I want to thank you, your book has helped me in so many ways. I have little boy who will be 3 in June and he still does’nt sleep through the night. He has probably slept through the night a handful of times since birth. When he wakes up at night he just crys for me and I check on him, then he goes back to sleep. He does’nt take cup or ask for anything when he wakes up. The night time waking is down to once a night for the most part. I have just run out of ideas, I’m not sure why he won’t sleep through the night. He goes to bed between 9-10pm and naps for about 2-2.5 hours at school during the day. He is a really good eater so I know he isn’t hungry when he wakes. I need some help! Hi, Sheena! First, it sounds like your toddler may be going to bed too late, and that could be causing part of the problem. I would encourage you to look at a typical sleep schedule for your toddler, and read a bit more about early rising. Additionally, you may want to revisit chapter 11 in your book, and see if any of the sleep delays mentioned apply to your son; you can always revisit the Shuffle to help him adjust to his new schedule and encourage him to fall asleep on his own.